Distribution of Photo Voter Slips to the Electors by the Booth Level Officers. The Election Commission of India has been issuing instructions from time to time regarding distribution of Photo Voter Slips to inform the elector regarding the polling station where he / she is enrolled into and his / her serial number in the electoral rolls. In the light of experience gained in the past and in order to further streamline the mechanism of distribution of Photo Voter Slips and bring in greater transparency, the Commission has issued detailed instructions on 21st March, 2014 (No.464/INST-VS/2014) which are available on its website http://eci.nic.in. 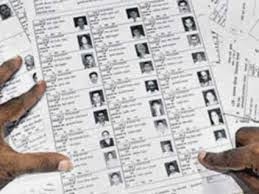 · Only one (1) set of Photo Voter Slips would be printed for the registered electors of each Assembly Constituency, duly authenticated by the Electoral Registration Officer, for distribution through the Booth Level Officers (BLOs). · The Returning Officer (RO) of the Constituency shall prepare a schedule for distribution of Photo Voter Slips by the BLOs. A copy of this schedule shall be given by the RO to the Political Parties, Booth Level Agents (BLAs) of all recognized political parties, if they have been appointed and contesting Candidates and their Agents, under acknowledgement. The BLAs of political parties/ Candidates’ Agents may accompany the BLOs during the distribution work. · The BLO shall give the Photo Voter Slip either to the registered voter or to an adult member of the voter's family who is himself/ herself a voter. The BLO shall obtain the signature or thumb impression of the person to whom the Photo Voter Slip is delivered in a register, as an acknowledgement of having received the Photo Voter Slip. When the BLA/ Candidates’ Agent accompanies the BLO for distribution, their signatures should also be obtained on the register, as a token of having seen the distribution process to genuine voters. Bulk distribution of the Photo Voter Slips by BLO or any other person is not allowed. · The undistributed Photo Voter Slips along with an alphabetical Voters' list shall be kept at a facilitation desk outside each Polling Station on the day of the poll, to be manned by the BLO concerned. Any voter who has not received Photo Voter Slip may collect it from this facilitation desk on the poll day.